Context: took me a long while to read this and some of that time was spent exploring St Andrews in east Scotland. This is a deceptively long book. It looked around 300 pages but stretched to 570. Not that it was overlong but there were times when I wished it had been shorter. Still, it was an interesting glimpse into a life that is no longer which is probably a good thing. It begins in the world of the rubber trading families of Singapore’s wealthy British elite in late 1941 when the city stood on the brink of invasion by the Japanese. It ends as the British surrender. The story follows the characters as their worst nightmares are realised and their world of order and control descends by degrees and despite their unbelief into anarchy and chaos. Throughout the book, Farrell is biting in his cynicism of the British and all they stood for. The characters are comic in their tragedy and, despite them suffering several inconveniences as the Japanese invade, you have little sympathy for them. 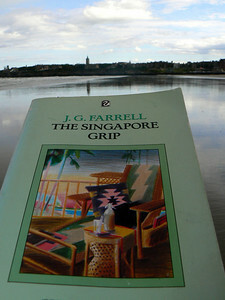 The backdrop that Farrell has created for this narrative is rich in its descriptive power of both Singapore’s culture and government at the time. If you’ve any interest in the Asian theatres of the second world war you will appreciate this. The Japanese are described in very sparing detail which only serves to give you a better perspective on what the British knew of them which was precious little. Never was so much underestimated by so many. If you’ve ever visited Singapore, this is worth reading. If you’re about to head over there, pack this in your hand luggage. It’s long enough to make the 15 hour flight seem shorter if you can drag yourself away from the garbage that vaunts itself as entertainment on airplanes these days. The city of Singapore was not built up gradually, the way most cities are, by a natural deposit of commerce on the banks of some river or at a traditional confluence of trade routes. Tomorrow is another day, as they say, as they say.